FLORENCE, Ala. (WHNT) - It's one of the most pressure filled moments in a man's life – the marriage proposal. Well, one Florence man went to the extreme to surprise his soon to be fiancée who is a nurse. The whole ploy was sent across social media and has become a hit. "Are we on? 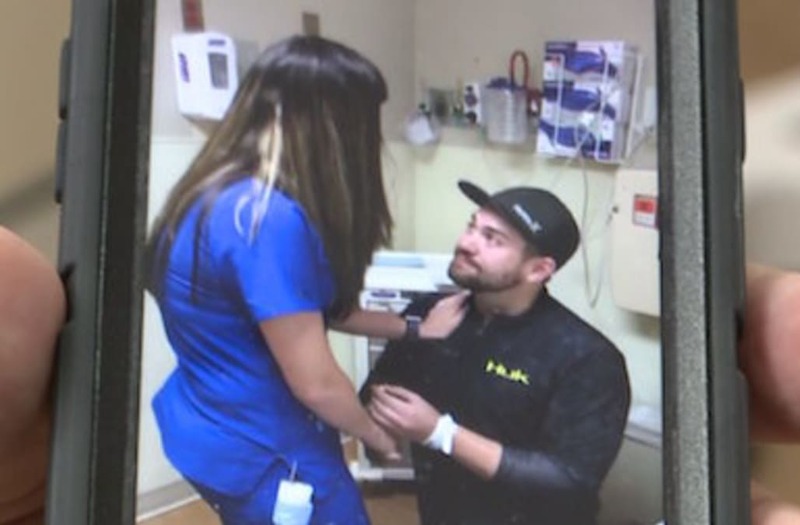 Alright we are on Facebook Live and this is the proposal for Bonnie," spoke Joshua Cochran to the phone camera as he sat on an emergency room bed. An Alabama man faked a serious injury to surprise his girlfriend, who is a nurse, with a marriage proposal. Cochran is an eager man trying to propose to his emergency room nurse girlfriend Bonnie Brzytwa. He said he tried to propose two previous times, both of those fell through. So he showed up at the ECM emergency room Wednesday morning. "The whole thing was you can't just come in with flowers, a boutique of flowers and a ring," Cochran said. "You actually have to come in as a patient. I thought okay, how can we do this? So the whole idea was a boating accident." Cochran wrapped his hand up to fake an injury. Beneath the gauze, an engagement ring. "He just seemed shaky and kind of concerned about it and his voice was a little quivery," explained Brzytwa. "So I figured he is serious about this, like this is something legit." "She was cutting it, a little bit shaky not much," described Cochran. "She was really professional and did good. And then as soon as she saw the ring it was shock, she was shaking and I was shaking probably as bad as she was." The following is an excerpt from the video as she uncovered the ring. Bonnie Brzytwa - "Oh my gosh." Joshua Cochran - "Will you marry me?" "I was in shock, his main goal was to surprise me and he went far and above surprising me," Brzytwa stated. Guys, good luck in trying to top this one. The video has already gone viral across social media. Early Thursday afternoon, the video posted to the North Alabama Medical Center – ECM Facebook page had reached 968,000 people and watched by tens of thousands. No word yet on a date for the wedding.